Depending on the thermal environment and the final temperature, pyrolysis will yield mainly biochar at low temperatures, less than 450 0C, when the heating rate is quite slow, and mainly gases at high temperatures, greater than 800 0C, with rapid heating rates. At an intermediate temperature and under relatively high heating rates, the main product is bio oil. Biomass pyrolysis can be performed at relatively small scale and at remote locations which enhance energy density of the biomass resource and reduce transport and handling costs. Heat transfer is a critical area in pyrolysis as the pyrolysis process is endothermic and sufficient heat transfer surface has to be provided to meet process heat needs. 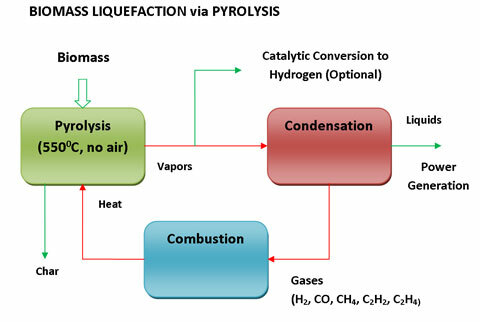 Pyrolysis offers a flexible and attractive way of converting solid biomass into an easily stored and transported liquid, which can be successfully used for the production of heat, power and chemicals. 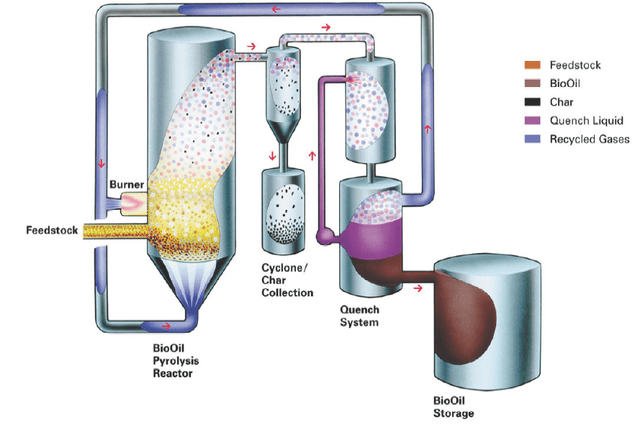 A wide range of biomass feedstocks can be used in pyrolysis processes. The pyrolysis process is very dependent on the moisture content of the feedstock, which should be around 10%. At higher moisture contents, high levels of water are produced and at lower levels there is a risk that the process only produces dust instead of oil. High moisture waste streams, such as sludge and meat processing wastes, require drying before subjecting to pyrolysis. Biomass pyrolysis has been attracting much attention due to its high efficiency and good environmental performance characteristics. It also provides an opportunity for the processing of agricultural residues, wood wastes and municipal solid waste into clean energy. In addition, biochar sequestration could make a big difference in the fossil fuel emissions worldwide and act as a major player in the global carbon market with its robust, clean and simple production technology.